Technology, according to Ellul, had become the all-pervasive material reality and rationality which defined the superstructure of contemporary society. Culture or politics, according to Ellul, does not determine the growth and development of technology. Rather, it is technology or technique which determines the culture or political life of a society. Nor was the understanding of technology as autonomous rationality a concern of French philosophers. German philosophers were as concerned with interaction of technology and human freedom and were as anxious to establish its roots in the philosophic and scientific thinking of the West. 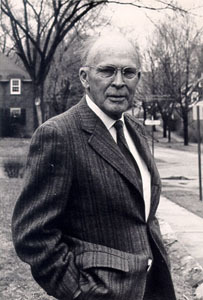 Leslie White, beginning in 1935, but largely through a series of articles published in the 1940s, began to articulate an evolutionary perspective contrary to that of anthropology of Franz Boas. In the piece “Energy and the Evolution of Culture,” published in 1943, White first put forward the “law” that “energy” times “technology” equals “culture,” meant to be understood as, William J. Peace notes, “culture evolves as the amount of energy harnessed per capita per year increases or as the efficiency of the means of putting this energy to work is increased” (Leslie A. White, 101.) Such a formulation came from specific methodological provisions. Each class of phenomenon may be studied as unique to itself, without reducing the logic of one category to that of another, or the anthropologist may consider the relationship between any of the categories. Thus, it would be perfectly appropriate, according to White, to tie discussions of agricultural productivity and the development of specific civilizations to specific geographical factors. White was not simply a “technological determinist” and can not be said to argue for the “autonomy of technology” in the same manner as Heidegger and Ellul. Much of his account of the relationship between mankind and technology agreed with that of Lewis Mumford. The progress of human beings and the outward forms of civilization, White argued, was facilitated not simply by the technology available to individuals but also was formed by a continual adaptation of the human body to environmental conditions. As the works of Ellul, Heidegger, Mumford, and White underscore, a concern with the ethical and civilizational importance of technological growth and development was a frequent touchstone of social theory. White’s concern with discovering an economy to the progress and advancement of civilization demonstrates the continual recurrence of the nineteenth-century notion of “science” as discovering the law-governed nature of things, as understood by nineteenth-century positivists and sociologists, in the works of twentieth-century thinkers. Nice summary. Since Prigogine proved that increasing energy in a system increases its complexity, and since the modern thermoeconomics is showing a constant relationship between wealth and energy input, White is looking more and more like the necessary link that was missing these days. I need someone to elaborate on the term “sciencing”. What does it really mean? What is the exact definition of sciencing? It is not in many dictionaries, nor can it easily be found online anywhere. I would greatly appreciate if someone would communicate with me on this. You can simply google my name and find my email address.